Anyone with a passing knowledge of the Red Bull company could be forgiven for thinking that their raison d’être is, firstly, to sell caffeinated soft drinks and, secondly, to sell more caffeinated soft drinks. Apparently this is not the case. 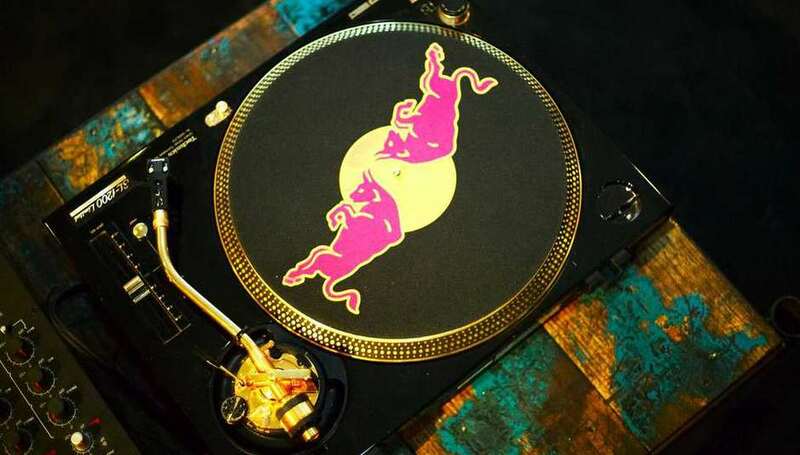 The Red Bull company exists to rock out, party hard and give up-and-coming young musicians wings. At least that’s the impression their press release gave me. I had come to a nondescript building near London Bridge to find out what sort of musicians would sign up to be part of a rock brand. I found myself stood in the lobby of the Red Bull Music Academy. Each year the Academy hand-picks sixty young musicians from all over the world to come together and make music, and it can count the likes of Mr Hudson, GoldieLocks and Flying Lotus among its alumni. A different city plays host each time, and the last three have been held in Melbourne, Toronto and Barcelona respectively. This year, it came to London. It came, specifically, to a spacious building on Tooley Street. Bought to house Red Bull’s new London HQ, it was first transformed into a musical playground that looked like it had been designed by Nathan Barley. There were brightly coloured sculptures that resembled those toy car rides you see outside arcades. There were Macs sat in the cafe loaded with GarageBand. There was a piano with all the wires pulled out into bushy eyebrows. It looked as if someone was trying to show the guts being ripped out of music, but it seemed rude to mention this to the pleasant PR guy showing me round. As he talked, I became increasingly embarrassed of my own cynicism. Reading Naomi Klein’s ‘No Logo’ had taught me all about ‘cool hunting’, corporations piggy-backing on the talent and creativity of young artists to boost their own sales, and it seemed pretty obvious that that was what was going on here. But as he showed me the recording studio fitted out with one of Rammstein’s old mixing desks, the basement rehearsal space and the storeroom filled with every kind of instrument or music-creating gadget you could dream of, along with plenty of private rooms in which to experiment, I began to see why competition was so fierce to get a place here. The glaring omission from it all was the Red Bull logo. There were plenty of cans about, but elsewhere the branding was always subtle and understated and the PR guy was at pains to point out that the Academy’s participants were given access to the facilities with no strings attached. They weren’t asked to hand over rights to their music or to make it a certain way. They weren’t even actually required to make any music at all. If this is selling out, it can never have tasted so good. She says she doesn’t think about how she’s going to make a living out of music in the age of Free, so I ask her how she’d feel about writing a song for Red Bull. So there you go. There’s no shame in corporate arts patronage. It’ll surely be soon forgotten anyway. No-one remembers the patrons of Shakespeare or Da Vinci, but they both took money from the wealthy to fund their work. Samuel Johnson once described a patron as “one who looks with unconcern on a man struggling for life in the water, and, when he has reached ground, encumbers him with help”, but that’s not a charge you can level at this Academy. It’s surely better for music that Red Bull plough their money into unknown creatives rather than slapping their logo onto an established band’s mega tour. The Red Bull Music Academy is testament to that, yet despite their enthusiasm it still leaves me feeling somehow sorry for the talented kids making righteous noise in the next room. They’ve been dumped into a brave new world that the most experienced heads in the business are struggling to make work. All they want to do is make a living making music but they’ve been raised on dreams of rock stars they can no longer possibly emulate. The rules of the game have changed and you can’t blame them and other struggling artists for feeling like there’s nothing left for them to do but grit their teeth and take the corporate bull by the horns.